Pictured above are New Visions Students after a graduation. Ho’opono’s New Visions Program became a reality on November 1, 2002. It is a required curriculum of effective blindness skills methods and techniques leading to increased self-confidence, empowerment and competitive employment. Generally, students are enrolled in program classes that runs approximately 12 months. This time period is flexible and students may be given additional skill-building time if it is necessary. Program students commit to full-time participation. 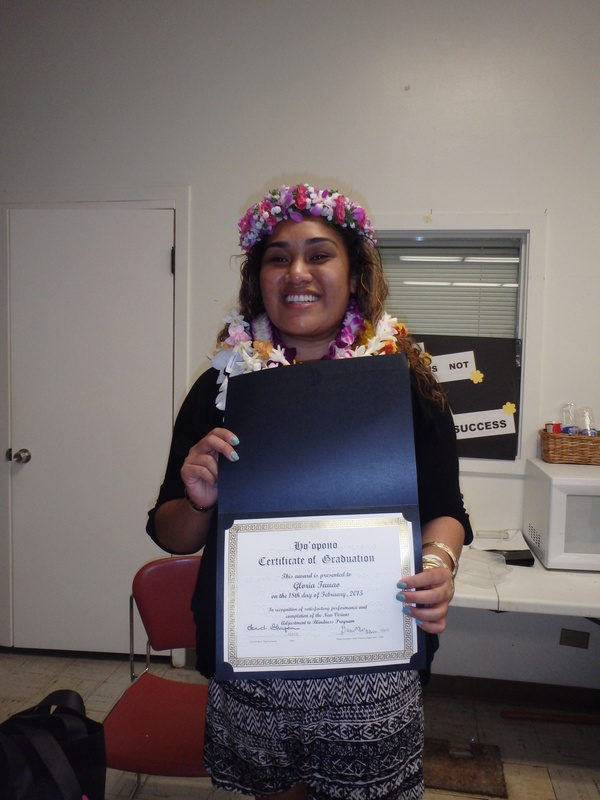 Participating in classes on site at Ho’opono affords shared experiences as well as peer mentoring and support. Sleep shades or learning shades serve as a tool for learning various skills without the use of residual vision. 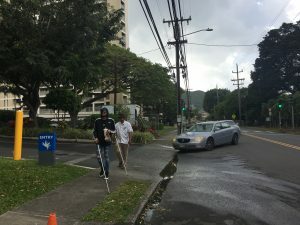 Ho’opono leases several nearby apartments where students may reside during their program training. While living at the apartments, practicing the New Visions program skills helps students to learn faster and in totality. If a consumer does not wish to participate in the full required New Visions Program curriculum, other options may be explored. For example, if a student wishes to only study Braille, Home Teaching classes outside of the Center may be arranged. 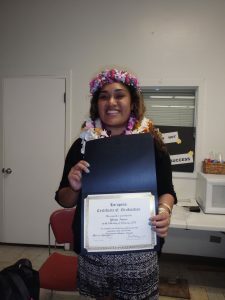 Pictured is a New Visions Student holding her graduation certificate. Students learn to read and write Braille and to use it in their daily lives. They are familiarized with other communication devices such as note takers, audio recorders and labeling devices. 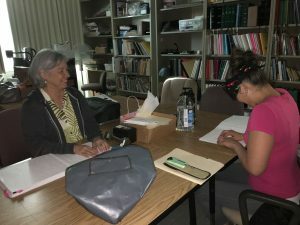 Pictured above is the Braille Instructor teaching a New Visions Student how to increase reading speed. 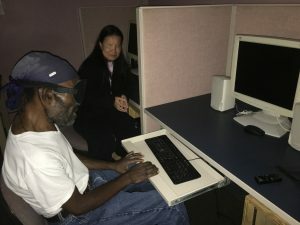 Business of Being Blind, or “BOBB” Class is just as important as Braille, Computer Access Technology, Woodshop, Orientation & Mobility and Personal & Home Management classes. 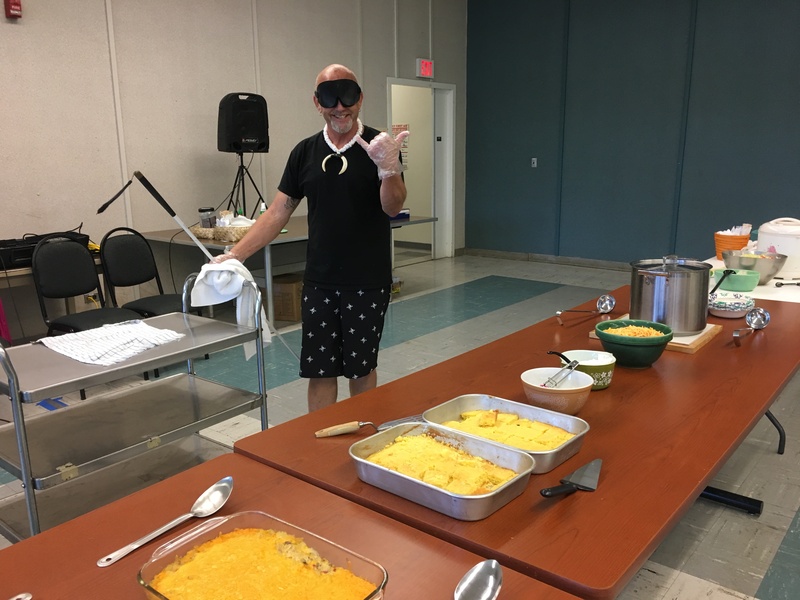 BOBB classes give students the opportunity to discuss the importance of their training, how it transfers to everyday life, and how a blind person would accomplish various tasks. Other topics and issues that are commonly discussed are policies and public attitudes on blindness, misconceptions about blindness, confidence and independence. Eventually students will develop their own blindness philosophy which will help them in the future. Subsequent to Field Classes, mini BOBB classes are held for students and staff to discuss the good and bad situations that arose as well as other related issues. 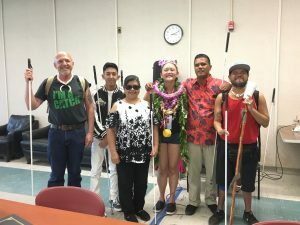 The Ho’opono Computer and Assistive Technology Class is a classroom laboratory where blind and visually impaired students learn about technology that can help them live independent and productive lives. Students gain confidence as they explore the possibilities with computers that include learning to type, word process, email, browse the internet and scan and read paper documents. Students are introduced to recorders, cell phones, note takers and other devices that help with personal organization, communication and taking notes. Students receive instruction that features learning by developing and using non visual skills. They are encouraged to explore and discover on their own with guidance by the instructor. They become independent, confident computer users without any reliance on vision. Pictured above is the Technology Instructor teaching a New Visions Student how to navigate the computer using JAWS Screen Reader. 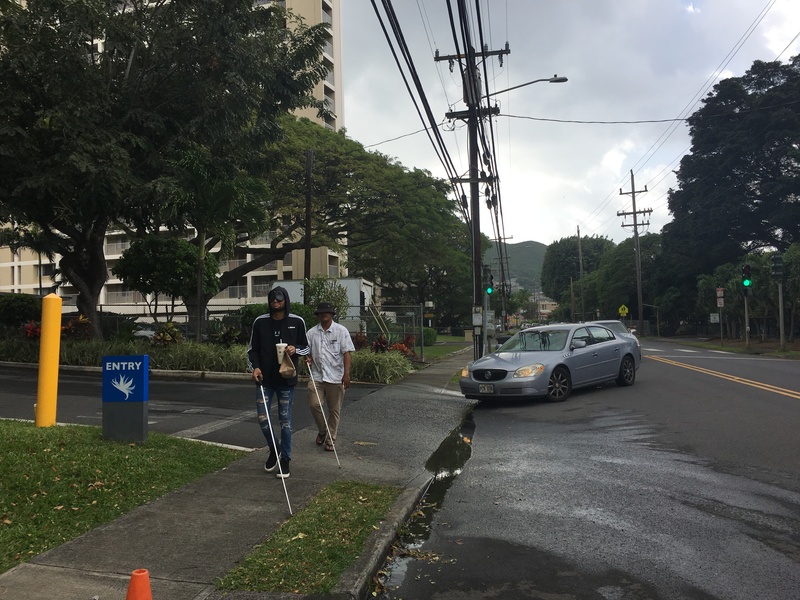 Students are given opportunities outside of Ho’opono to implement the blindness skills they are learning in order to further their self confidence. Field classes allow students to interact with the public and demonstrate that blind people can enjoy everyday things as anyone else. 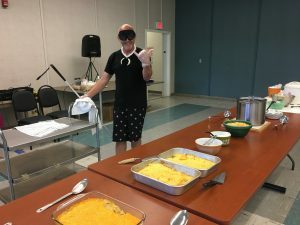 The objective for Field Classes is to have students believe that although they are blind they can still participate and enjoy doing various activities without sight. 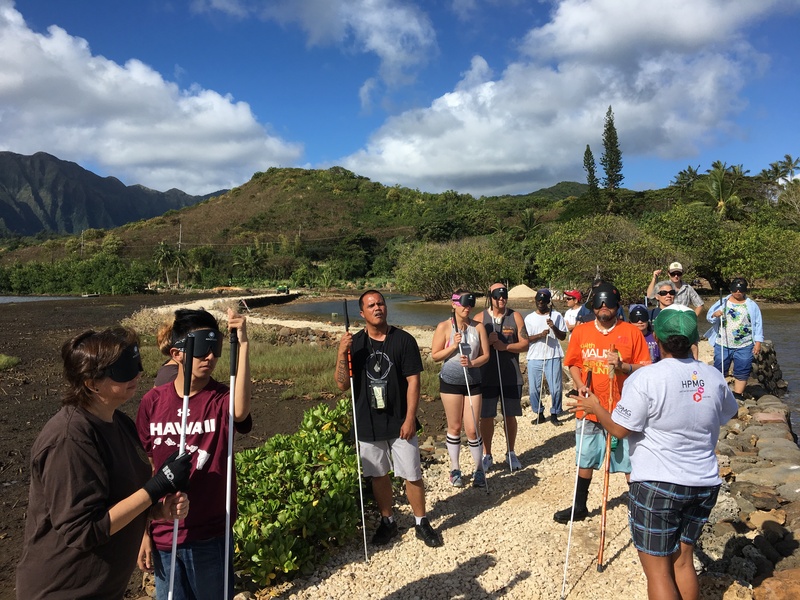 Examples of field classes that Ho’opono New Visions program students have participated in are horseback riding, Hawaiian Adventures Water Park, University of Hawaii Athletic events, ice skating at Ice Palace, kayaking, visiting museums, and eating out at various restaurants throughout Oahu. 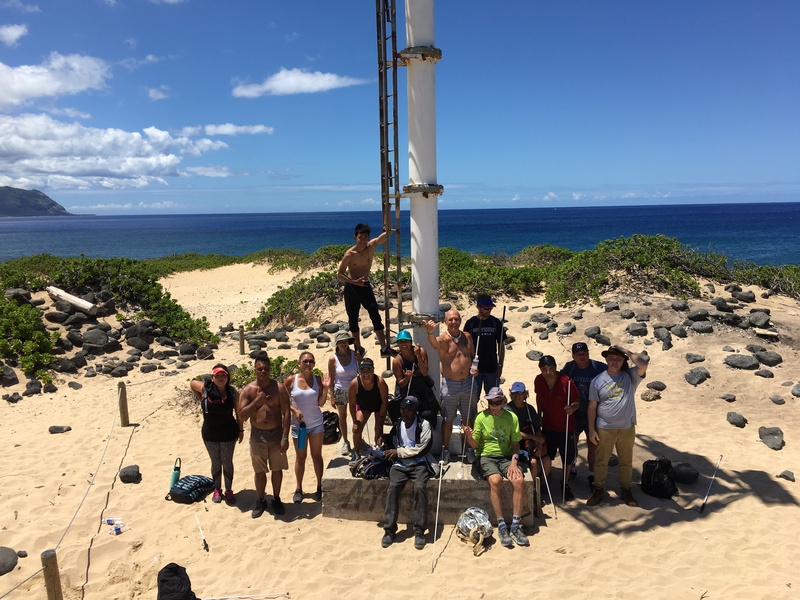 Pictured above are the New Visions Students on a Field Class at Paepae o Heeia. 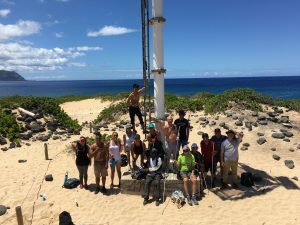 Pictured above are the New Visions Students after a long hike out to Kaena Point. Orientation and Mobility (also known as travel class) involves receiving long cane instruction (no folding or telescopic canes are used during training) while sleep shaded. A student learns to apply non-visual skills developing the other senses through the application of alternative techniques and problem-solving a variety of situations. The student learns to transfer these skills to a variety of environments. During instruction, a student learns to achieve benchmarks which act as stepping stones to the final travel goal which is to learn to become an independent traveler. A student also learns orientation skills such as traffic sounds, the use of natural elements such as the sun and the wind, and employs the use of a grid pattern of streets for downtown travel. Eventually, the student is challenged to complete this class by planning an all day travel when all the learned skills and techniques are applied, thus mimicking a very busy day in which the student must travel to new as well as familiar places. Pictured above is a New Visions Student walking in the community with his instructor. In Personal and Home Management classes, also called “PHM”, students learn to use non-visual strategies for cooking, sewing, budgeting, cleaning, labeling, matching clothing, laundering, ironing, banking, shopping, and any other task that is needed to live and manage a home independently. Students cook dishes ranging from the simple (sausage and eggs) to more complex (manapua, lumpia, or jerk pork tenderloin). They sauté, boil, steam, bake, deep fry, and barbecue. After the cooking is done, they are responsible to clean up. Students learn how to sweep, mop, and vacuum using alternative strategies, as well as threading sewing needles, sewing on a button, and sewing a hem. If needed, some students are taught how to sign their signatures and lace and tie their shoes. Students also learn how to budget and track monthly expenditures using alternative, nonvisual, formats (Braille, audio recordings, or computer with JAWS software). Students gain experience serving themselves in a buffet line, eating at a fine dining restaurant, calculating tips, carrying a tray without spilling the drink at a fast food restaurant. To graduate from PHM, students plan, shop for, prepare, and serve two group meals: the first a 3-course meal for 6 invited guests served at a formal dining table; the second a 5-course meal for the 25 students and staff at Ho’opono. Pictured above is a New Visions Student standing next to his large group meal which we call Lunch in the Shade. This is a 5 course buffet for 20-30 people. 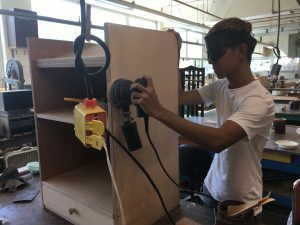 Shop classes provide students the opportunity to incorporate an array of adaptive skills related to woodworking and the use of power tools in order to overcome fears, misconceptions and stereotypes about the capabilities of persons who are blind. 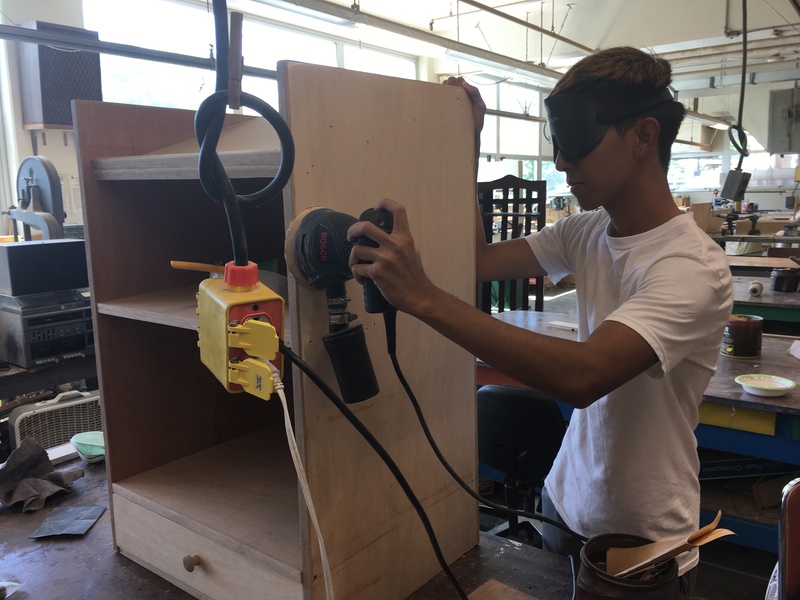 Pictured above is a New Visions Student using an orbital sander on his Woodshop project.